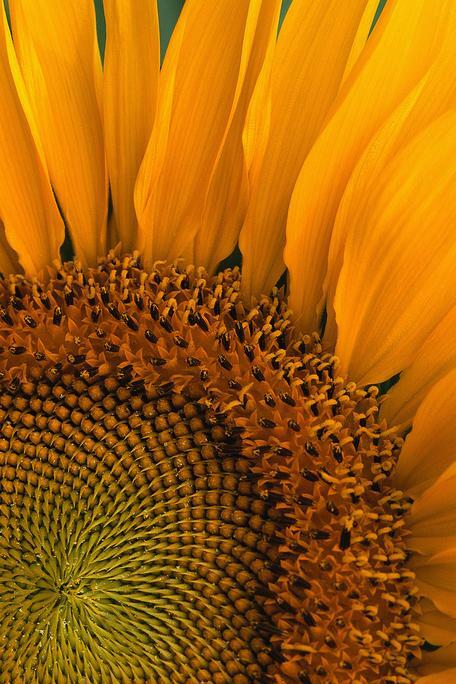 The seeds of a sunflower follow the Golden Ratio in their growth patterns. Provenance: Photo from Microsoft Corp. Solid quantitative reasoning skills (logic, mathematics, and statistics) are at the core of understanding and interpreting many sustainability concepts and are required for making sustainability-related decisions. Ample opportunities for introducing sustainability examples exist in math courses from algebra and geometry to calculus and statistics, and even in advanced graduate-level courses. Sustainability issues are inherently interdisciplinary. See the Resources & Discussions page for resources that span multiple disciplines and the Disciplinary Perspectives pages. Sustainability can be addressed at all levels of the mathematics curriculum and in quantitative reasoning and statistics courses. Thus, there are many pathways to introduce sustainability themes into a wide range of topics. Understanding rates and slopes is critical to interpret climate change topics. For more resources on teaching sustainability across many disciplines, see the SERC Sustainability Site Guide. This site guide contains annotated links to hundreds of teaching activities, course descriptions, visualizations, and articles compiled through a number of projects. Mathematical Modeling in the Environment, Hadlock, Charles R., 1998, The Mathematical Association of America. Interdisciplinary textbook aimed to facilitate learning of mathematical concepts in the context of relevant environmental issues. Environmental Mathematics for the Classroom, Fusaro, B.A. and Kenschaft, P.C., 2003, The Mathematical Association of America. An elementary mathematics textbook to present mathematics concepts in the context of environmental issues. Mathematics for the Environment, Walter, Martin; 2011, Chapman and Hall/CRC. Explores environmental issues through elementary mathematics. Environmental Issues: Looking Towards a Sustainable Future (4th edition). 2013. Robert L. McConnell and Daniel C. Abel. The introductory chapter, "Basic Concepts and Tools: Using Math and Critical Thinking," addresses key math tools used in addressing sustainability topics, including: the metric system, scientific notation, unit conversions, exponential growth, accuracy, precision, etc., and uses these throughout to address a wide array of sustainability issues. Quantitative Reasoning and the Environment: Mathematical Modeling in Context. 2007. Greg Langkamp and Joseph Hull. Uses sustainability examples and real world environmental data to address numeracy, function modeling, difference equation modeling, and elementary statistics. Mathematics of Climate Change: A New Discipline for an Uncertain Century. 2008. Dana Mackenzie. Mathematical Sciences Research Institute, Berkeley, CA. Presents opportunities for mathematicians and climate scientists to collaborate on models and communications with the public, elected officials, and the media about the complexities of climate systems. Quantitative Reasoning and Sustainability. 2012. Corrine Taylor. Numeracy: Vol. 5: Iss. 2, Article 1. This editorial explores the commonalities between QR and sustainability and advocates for the use of authentic and important sustainability topics for engaging students in QR and mathematics courses. Tom Pfaff's Sustainability Page for Mathematics Courses Includes data sets, example worksheets, graphs, resources, and the background information you need to incorporate a sustainability theme or just an example or two into calculus and statistics courses, and more. Tom Murphy's "Do the Math" Blog Focuses on estimation and modeling for energy, climate change, and economic growth. Facing the Future Offers tools for K-12 educators that equip and motivate students to develop critical thinking skills, build global awareness, and engage in positive solutions for a sustainable future. On the top right is a search bar; search for "Math." Creative Change Educational Solutions Supports K-20 leaders and institutions to make education for sustainability the basis of policy and practice. Their Curriculum and Resource Center offers a growing collection of multimedia materials to support educators to enhance existing lessons, redesign units, or create entirely new courses. MPE 2013 is "a year-long program to publicize and promote the role of mathematics in developing a better understanding of [the] dynamic processes affecting Planet Earth, ranging from geophysical systems governing climate to economic and financial activity." Includes data sets, example worksheets, graphs, resources, and the background information you need to incorporate a sustainability theme or just an example or two into calculus and statistics courses, and more. The Center for Discrete Mathematics and Theoretical Computer Science has a number of sustainability resources including documents from past workshops. The IMU is a member of the International Council for Science and seeks "to promote international cooperation in mathematics, to support and assist the International Congress of Mathematicians and other international scientific meetings or conferences and to encourage and support other international mathematical activities considered likely to contribute to the development of mathematical science in any of its aspects, pure, applied, or educational".